In the mid nineties Garry Moonboot & Kim Oz decided to have a break from the electronic side of things and try some acoustic ideas under the name Moonboot Oz. These ideas turned into the Organic Mushrooms EP and this album. The duo played a number of live gigs (including a memorable night with the Porcupine Tree) where they were joined by original Magic Mushroom Band drummer, Jim Lacey. Jim also features on this album. The trio of Garry, Kim and Jim also had a memorable tv appearance on one of Sacha Baron Cohen's early tv shows which is worth checking out on you tube. 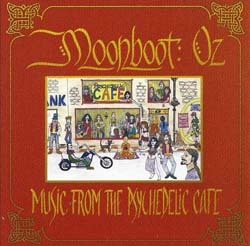 The album features some great Garry Moonboot compositions including You're My Rainbow, Shine, Another Planet and many others.